Bet Tyson Fury to win in Rounds 1-3 at +350 at William Hill. Bet Tyson Fury to win in Rounds 4-6 at +188 at William Hill. 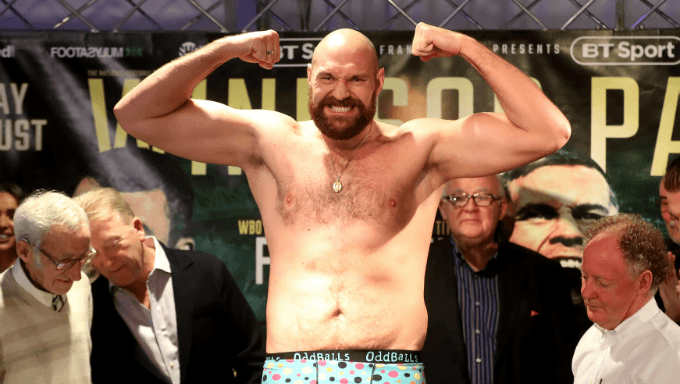 Former heavyweight champion Tyson Fury continues on the comeback trail against seasoned veteran Francesco Pianeta on Saturday, Aug. 18, at Windsor Park in Belfast, Northern Ireland, a bout that presents some real opportunities for boxing bettors. Fury vs. Pianeta will be presented live on BT Sport 1 in the UK as well as on Showtime’s YouTube and Facebook pages in the U.S. starting at 3:30 p.m. E.T. The bout is an undercard fight for the Carl Frampton vs. Luke Jackson featherweight battle. Fury is a huge favorite in the bout. Ladbrokes tabs Fury at -10000 while William Hill halves it to -5000. While the odds on Fury winning the fight are astronomically on the side of the Englishman, the numbers have slightly shifted toward Pianeta as fight day draws near. Still, Ladbrokes makes Pianeta a huge underdog at +1600, with William Hill following closely at +1400. Fury (26-0, 19 KOs) defeated Wladimir Klitschko in November 2015 to win three of the four major alphabet titles along with the Ring Magazine and Transnational Boxing Rankings Board (TBRB) heavyweight crowns. After a two-and-a-half-year hiatus from boxing, Fury returned to the ring in June to knockout cruiserweight Sefer Seferi in a bout that looked more like a glorified sparring session or exhibition in celebration of Fury being a boxer again. Regardless, Pianeta is a step up in competition for the 29-year-old Brit with Irish Traveller roots. Unlike Seferi, Pianeta is a heavyweight who has contended for world titles in his career and has been in the ring with some of the best heavyweights in the world. Still, Fury has Pianeta beat in physical size, speed, world title credentials and overall talent. The gregarious puncher has his sights set on a showdown with WBC heavyweight champion Deontay Wilder. and the fight seems to be on the way to being made for later this year. Fury should have all the incentive to give his best effort against Pianeta, so people looking to place bets now on the potential Fury-Wilder bout would be wise to at least get one more look at him before deciding. Pianeta (35-4-1, 21 KOs) is a 33-year-old southpaw who has fought for both legitimate and secondary world titles in the past but has never accomplished the championship feat. Pianeta’s first loss came when he was knocked out by Klitschko in 2013 in one of Klitschko’s many title defenses. He rebounded from that experience by stringing together a few more wins only to be knocked out again in 2015 when he tried to wrestle away a secondary world title from Ruslan Chagaev. He’s been more or less a regional-level fighter ever since, or maybe that’s something he’s always was. An Italian-born fighter who fights out of Germany, Pianeta has lost two of his last three fights. It’s probably safe to say he’s on the downturn as a professional. Kevin Johnson dropped Pianeta with a body shot in the seventh round in October 2017 and he lost a decision to Croatian prospect Petar Milas in June. Pianeta’s only win during that time frame was a knockout against Daso Simeunovic in that fighter’s second pro fight. The most likely outcome of the fight is a stoppage win for Fury. Pianeta has never been a good enough heavyweight to go 12 rounds with world championship-caliber fighters, and he seems to be on the downward slide that starts to happen to every fighter over time. The chance Fury vs. Pianeta goes the distance is pretty slim. The only caveat is that Fury’s win over Seferi was a simple showcase fight in which nothing was actually proven about how far along he’s come since the long layoff. Fury didn’t have to evade hardly any punches in the fight and those that were thrown at him weren’t fueled by bad intentions. Seferi fought in a way that suggests he knew he was only there to lose and that his purpose was to help Fury get back to world title contention. Fury should take care of Pianeta inside the distance. How fast he does it depends on his level of commitment to it. While he most always has a lot to say outside the ring before his fights, Fury’s recent comments suggest he knows he needs to make a big splash on Saturday to help fuel the fire of the potential Wilder fight. "What you’re likely to see from me on Saturday is a heavyweight Sugar Ray Leonard. Anything less is a failure. Judge me on that comment—a heavyweight Sugar Ray Leonard," Fury said, per the Press Association. Fury should beat Pianeta within the first six rounds. William Hill will let you bet on Fury in Rounds 1-3 at +350 or Rounds 4-6 at +188. Both outcomes are plausible expectations of what will happen this weekend and both offer decent returns.